Most of us feed birds because we enjoy bird-watching and want to help wildlife in some way. But did you know that feeding wild birds may actually create conflicts with other wild animals or perhaps even harm the birds? Here are a few things to consider when feeding wild birds to avoid conflicts and unintended harm. 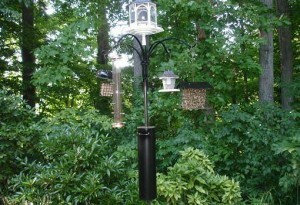 Stovepipe baffles prevent squirrels, chipmunks, and raccoons from climbing up feeder poles. Choose seeds that will attract the bird visitors you want and less will get wasted. Feed a hull-less or “no-mess” seed or mixture so less seed litter falls to the ground. Fill feeders with just enough seed to last the day to reduce the likelihood of nighttime visitors looking for a meal. Protect hanging feeders with hood or dome baffles, and those on a pole with stovepipe or pole baffles to prevent squirrels from shimmying up poles and jumping on to feeders from above. Chipmunks are skillful at pole shimmying too. Avoid conflicts with bears by taking your bird feeders down between the months of November through March or using a bear proof feeder. Use a no-mess birdseed or sweep under feeders to discourage hungry skunks and other critters. 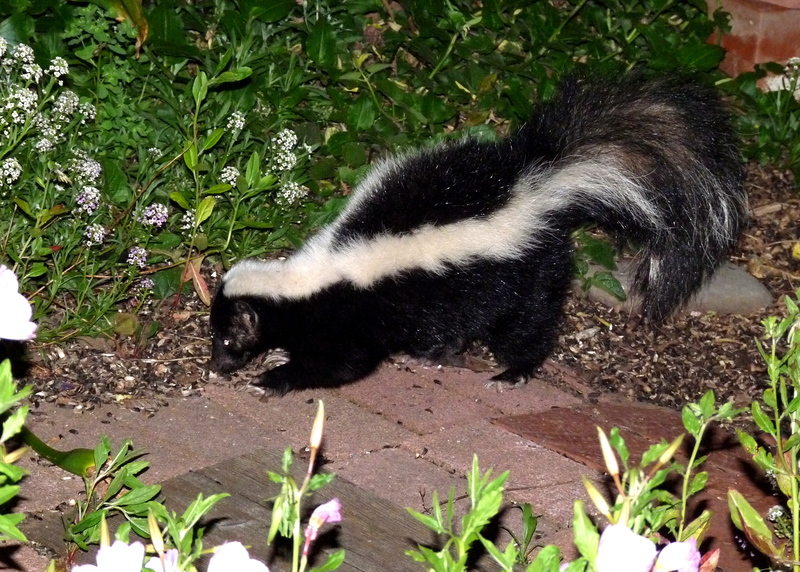 Raccoons, and skunks, and opossums, oh my! Raccoons, skunks, and opossums can also be attracted into yards by a birdseed buffet. A steady supply of bird seed can result in these critters becoming accustomed to hanging out in your yard which you or your neighbors may find undesirable. So follow the steps listed above for rodents for all neighborhood wildlife. Beyond the spillage from bird feeders, avoid providing wildlife with handouts, either directly or indirectly by leaving pet food or other food stuffs outside. This will encourage wildlife to associate food with people and lead to conflicts, which almost always end badly for the animals. Bread, stale or otherwise, has no nutritional value for birds, and feeding moldy bread can make them sick. Wet seed is spoiled seed. During rainy season, fill feeders with just enough food to get the birds through the day, otherwise it will sprout and get moldy. Be sure to clean feeders regularly. Refresh and clean hummingbird feeders at least every two to three days. During very hot weather, change the nectar and clean feeders daily. Place feeders within 10 to 12 feet of a brush pile or evergreen tree or bush to allow them a place to escape from predators. To prevent birds from striking windows, be sure feeders are either less than three feet or more than 30 feet from windows. Provide a source of clean water, refreshed regularly, and kept thawed in winter with a heater. Although you should keep your cats inside for their sake and for the sake of wildlife, if you keep bird feeders, and keep your cat(s) outdoors, that is akin to setting a lethal trap for birds.